When storm-induced waves exceed the height of the dune, sand is transported over top of the dune and deposited inland. This process, known as overwash, causes a significant change in the landscape of the island. During the overwash process, portions of the dune are often completely eroded, and sand is deposited inland in large layers called overwash fans. These fans can bury the first floors of homes, cover roads, fill ponds, and cover coastal vegetation. 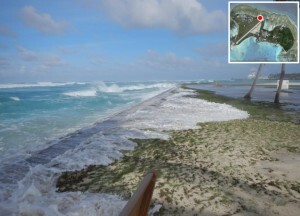 Depending on the severity of the storm and the width of the island, these overwash fans can extend the entire width of the island. When sand is transported from the seaward to the landward side of the island, the island migrates landward in a process known as barrier island rollover.